Lowdown: The personal story of three groups that saw the 2008 financial meltdown coming. In his book The News, Alain de Botton laments the financial news section's dreary way of conveying its messages. I, and probably you, too, agree: unless we have some personal interest in a specific tidbit of financial news, most of us avoid that section in favour of the more saucy stuff. Yet finances, as anyone with a wallet could tell, matters. It matters a lot. Take, for example, the big worldwide financial meltdown of 2008, which started with the collapse of the USA mortgage market but ended up affecting the whole world. I think that in many way we still haven't recovered. Question is, how does one take this particular financial subject matter and make a movie out of it? A non documentary movie, specifically. And how does one do it in an entertaining manner, the manner de Botton is alluding to? The Big Short took applied a three pronged approach to address this problem. The first is personalisation. Instead of dealing with big markets, we follow the personal stories of 3 groups (which amount to 4 people): a brilliant yet weird Asperger's guy, Michael Burry (Christian Bale), who saw the meltdown coming years in advance by simply cracking the numbers; two young investors that figured it out, too, through their limited experience (just because it was so obvious once anyone bothered to put convention aside); and an eccentric Jewish investment banker, Mark Baum (Steve Carell), who, with his group and a lot of effort, figured it out too. All represent real people, by the way; to more than one extent or another, at least as far as can be corroborated through Wikipedia, the events and the people depicted in The Big Short are real. The second, and as already hinted, is The Big Short's reliance on Big Names. There's Bale, there's Carell, but there are also numerous others in roles of various scope: Ryan Gosling, Brad Pitt and Marisa Tomei to name a few. The beauty of it all is that it works. 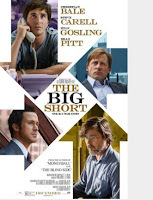 The Big Short, instead of being The Big Bore that one would expect given what passes for financial journalism, is a thrill despite being lengthy. And despite predictability, too (I mean, we all know what happened at the end). It delivers its message straight in our face and it does so without shame, getting away with it by virtue of doing it oh so well. Best scene: Burry's closing statement is all about his personal confrontational, fact driven, approach. He tells us how he met his wife by joining an online dating service and stating in his profile that he's a student with one eye, social problems and huge debts; his would be wife picked him not because of the eye or the debt, but rather because of his honesty. Me, I wish the two all the best. The even better scene: As the last minute or two of this movie play out, the unmistakable drumming of John Bonham in Led Zeppelin's When the Levee Breaks can be heard in the background. The narrator sums things up, and then we skip straight over to Robert Plant's singing (and the movie credits). I know this is nothing as far as the art of movie making is concerned, but I love this songs so much and it fits the occasion so well that it significantly uplifted my opinion of the movie. Overall: Watch and learn. 4.5 out of 5 crabs and probably the best made movie I have seen in a while.